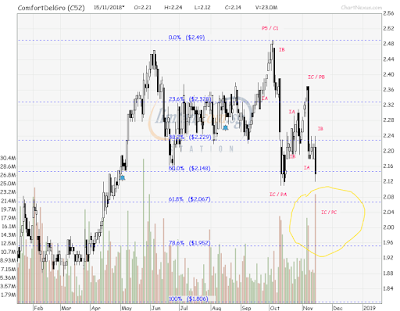 Another index component stock that stick to Elliott Wave Fibonacci guideline very closely. 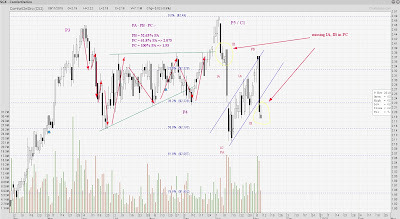 ComfortDelGro completed a 5-wave Primary degree Elliott Wave, Cycle degree Wave 1, at $2.49 since the start in Dec 2017. Currently it is in Cycle degree Wave 2 correction. So far the correction appears to be doing a zigzag pattern, a typical pattern for wave 2 (Cycle degree Wave 2 in this case). 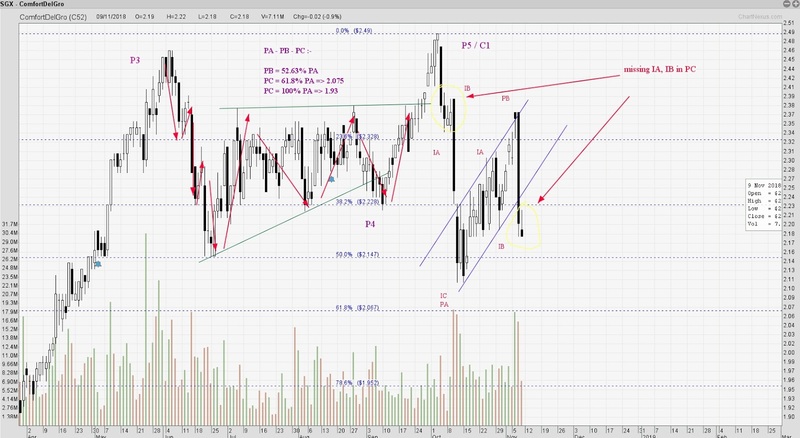 A typical Fibonacci guideline for a zigzag pattern is Wave B to retrace between 38% to 79% of Wave A. A 79% would make PB to be between $2,41 - $2.42. Hence, current level is very close to the end of PB. Note also that the 61.8% and 78.6% Fibonacci Retracement level for Cycle degree Wave 2 are at $2.07 and $1.95 respectively. 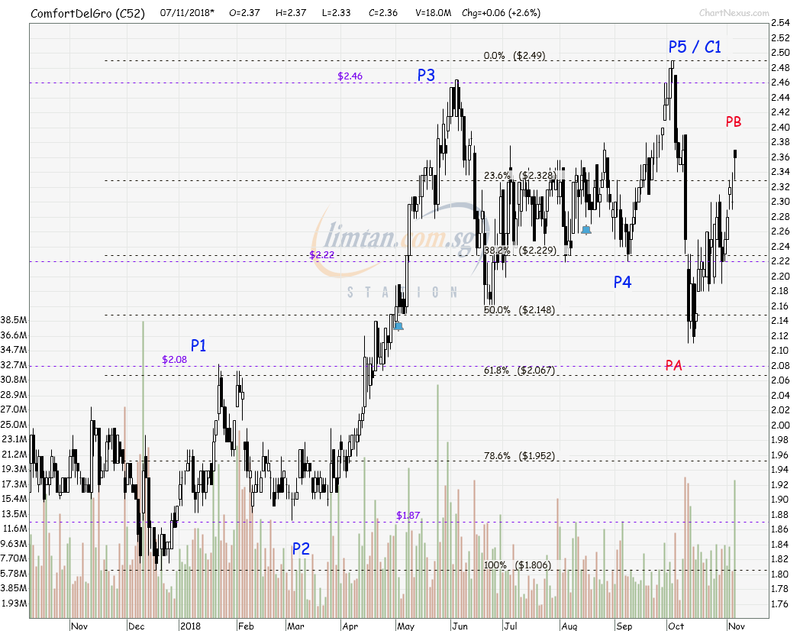 The above calculation price level for PC falls well within the 61.8% - 78.6% Fibonacci level for a wave 2 correction. Op Profit increased 1.9% y-o-y and 3.56% q-o-q. This is something that was expected, better than 3Q17 as being analyzed on 11th Aug 2018 after the 2Q18 result. Net Profit fell 2% y-o-y but increased 4.67% q-o-q. This has missed the expectation that its Net Profit could be equal to that of 3Q17 as analyzed on 11th Aug 2018. The reason for lower Net Profit was lower dividend from its investment. In 2Q18 it received +$0.5M or +22.7% from its investment but in 3Q18 it received -$0.6M or -15.8% from its investment. Should it received the same absolute increment in dividend in 2Q18, its Net Profit would be $79.1M (-1.25% vs 3Q17). 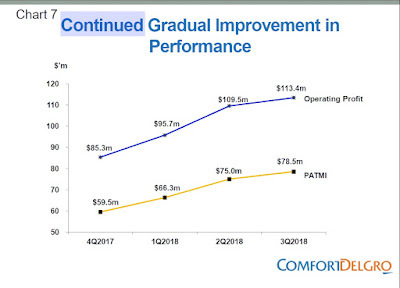 Should it received the same percentage increment in dividend in 2Q18, its Net Profit would be $83.16M (+3.82% vs 3Q17). 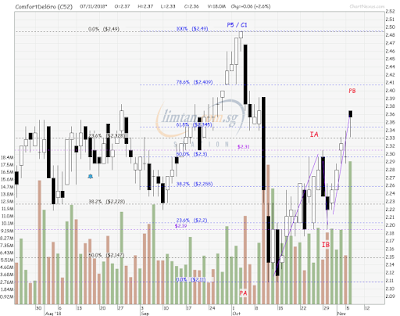 Furthermore, its Net Profit is +4.67% q-o-q. The worst part of its earning is over, the sharpest recovery part probably also over, now is the stabilization or the gradual recovery. Its fundamental might not be the same as in the past due to the fact that private hired car is here to stay and its taxi operation is no longer the same as in the past. However, its management has finally realized that and starting to diverse into other investment to offset the good old days of taxi operation. The result showed that effort is working. From the look of it, it just need 1 or at most 2 more quarters to finally turn the corner. That is the fundamental of ComfortDelGro and how its being associated to the price movement ? Fundamental dictates the price movement which allows TA to project and not the other way round. The Elliott Wave count should not change much. 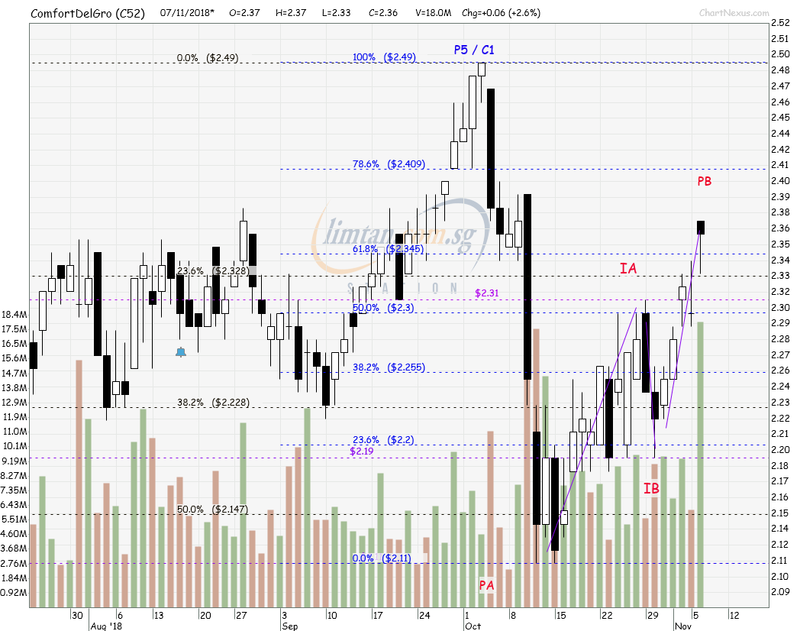 It is in the final PC leg of a zigzag pattern. The only missing is an up down in IA and IB in the PC wave. The set of 3Q18 earning is not a negative result which should lead to the formation of the IA and IB before resume the final down. 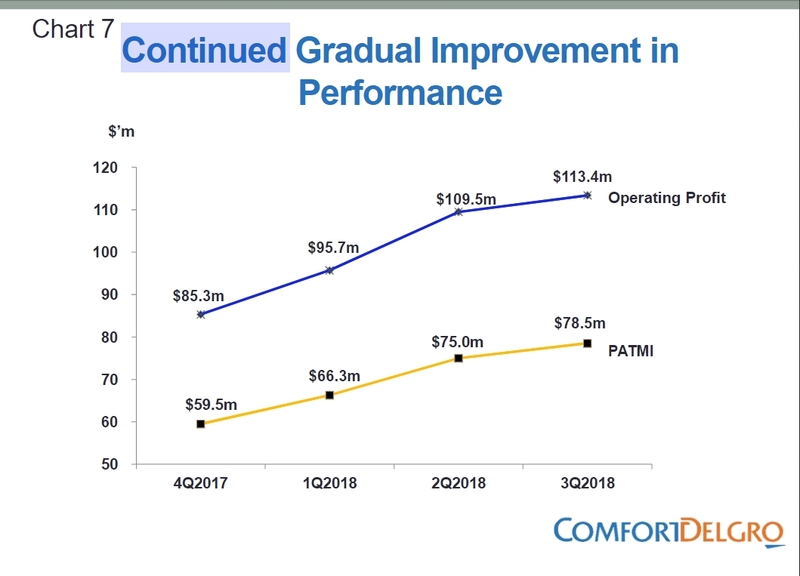 The final down to the above projected target is something not surprising should it happen as ComfortDelGro has yet to fully turn the corner in its earning. It is gradually improving but not there yet. Another 1 or 2 more quarters might do the work. With that, its correction is at least 2/3 completed and probably going into 3/4 completion next week. There isn't much downside to it comparing to the upside it will generate going forward. Will it go down to the projected target as what Elliott Wave describes or some price level above that will have to depend on the fundamental. The breakdown at $2.18 today confirmed the completion of IA and IB of PC and heading down toward the various targets of PC as mentioned above.